Ah the world of Kids' Sports. Fun or Competitive? Experts tend to disagree. The choice is yours! Kids' competitions are not like they used to be. Gone are the days of friendly soccer games where everyone gets a participation trophy. Today's kids' sports are gritty and almost as competitive, if not more so, as adults in the big time! Families tend to be getting involved in competitive activities more than ever before, and the results can be positive or negative. When is it okay to let your child quit an activity he/she no longer loves and when are you being a "good parent" by pushing it just a little bit more? How can you encourage them to be the best that they can be without compromising their quality of life and/or their self esteem? Many experts have debated over whether or not competition for kids is healthy or detrimental. While views defer, all do acknowledge that there are some risks at hand that have the potential to damage. These include coaches talking down to kids as if they were doing badly in the Superbowl, and parents shouting from the sidelines, which teaches kids disrespect and a negative edge to competitiveness. However, despite the opportunity for severe mistreatment, many agree that there is still a lot of good to competitive sports, such as learning to be gracious when you lose or are defeated, as well as embracing the positive effects of physical fitness. As obesity is becoming a more and more serious problem in our society, it is important for children to remain active and understand the importance of that. Children will get hurt and they have more of a probability of getting injured if they participate in Kids' Sports. There has been speculation over the years that children's bodies are breaking down due to excessive sports playing and other activities of a physically competitive nature, but this is not usually recognized as a huge problem. However it is important to know what to do if a child is injured and what you can do to prevent them. Sports injuries are those that are defined as sprains, strains, fractures, dislocations, and any other physical ailment that comes about from playing sports. As kids are pushed harder and harder in their team sports, injuries tend to become more frequent. Fortunately kids are resilient, and as long as it is your child (and not just yourself) that wants to participate in organized sports, then you shouldn't have a reason to worry. If a child gets injured, it is important that they are not forced to play. Kids tend to be either overly dramatic or hiders of pain when they get hurt, and the safest thing that you can do no matter what the reaction, is to take the child out of the play. Children should not be encouraged to "push through" their pain as many adolescents and adults are when it comes to athetlic competition. Always have a first aid kit on site, and if possible, keep a nurse or doctor near the sidelines during big games. Whether you agree with kids' sports or not, prevention is important and can help both sides of the argument to be a little more content. Always be sure that the kids are wearing sunscreen to prevent burns and overheating. Also make sure that the children have properly stretched and limbered up their bodies before going into super active play. 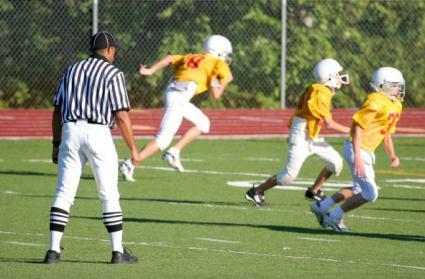 Quality coaches will put the child's safety first and the impending victory of kids' sports second in their mind. Talk to your child on a regular basis to make sure that sports are what they really want to do. Always keep this question in mind - Whose dream is it? Yours or Theirs?